The Liberty 1-1/4 in. Flat Black Round Knob is a piece of decorative hardware that creates the finishing touch for cabinetry. Classic design and a black finish add contemporary style. Comes with 8-32 in. x 1 in. machine screws. From Liberty Hardware, the Silverton Collection helps you create the bathroom of your dreams. Designed to coordinate with the Delta Silverton bathroom faucet and accessories, the Silverton Collection features detailed lines with an elegant, timeless design. The vibrant Polished Chrome finish looks equally refined on bathroom vanities or kitchen cabinets. Garrett 1-1/4 in. Flat Black Solid Round Cabinet Knob The Liberty 1-1/4 in. Flat Black Round Knob is a piece of decorative hardware that creates the finishing touch for cabinetry. Classic design and a black finish add contemporary style. Comes with 8-32 in. x 1 in. machine screws. Garrett 1-1/4 in. 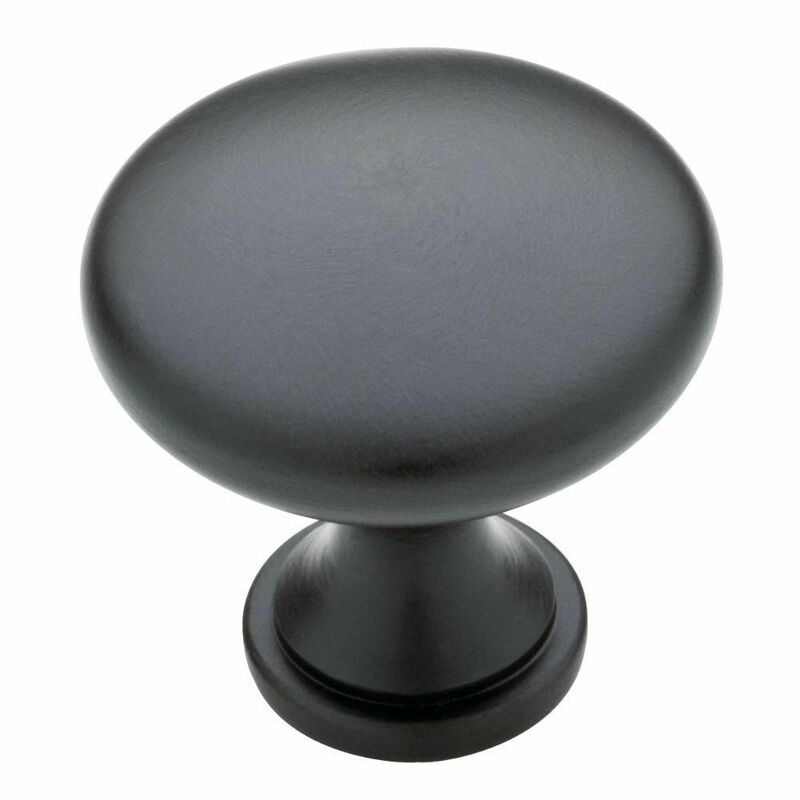 Flat Black Solid Round Cabinet Knob is rated 5.0 out of 5 by 11. Rated 5 out of 5 by katrina from Very nice cabinet knobs or for whatever. Love the flat black, and easy to open doors. They will a... Very nice cabinet knobs or for whatever. Love the flat black, and easy to open doors. They will accent nicely if you have black alliances, they go with any color cabinet. Very sturdy, soft to the touch, and easy to clean. Rated 5 out of 5 by Wanda from Love these knobs. Just what I hoped for. Bought as... Love these knobs. Just what I hoped for. Bought as an upgrade for our kitchen cabinets. The only problem, the screws were too long for our old cabinets so we had to buy new screws. Would recommend to anyone. Rated 5 out of 5 by Kathryn from Classic look.... Classic look. Rated 5 out of 5 by HomeDepotCustomer from Look great and and easy to install.... Look great and and easy to install. Rated 5 out of 5 by HDsmiles from Excellent Knobs for Fit, Finish and Feel Understated excellence for my dark cherry cabinets. Good weight, great price on the 10-packs and having 2 lengths of screws (I needed both). Love the feel and room to put fingers underneath like a wine glass to pull rather than having to grab the outside of the knob. Only wish they were 1/4" bigger for my 40" cabinets because they look a bit small, but don't call attention to themselves which was one thing I was looking for. I matched them with Liberty 96mm Martini Classic Pull in flat black, PN0312H-FB-C and work great together in my kitchen. Rated 5 out of 5 by WindyAero from Solid knob - black I was pleasantly surprised when I lifted the knob out of the box, it had some weight to it. It comes with 2 different length screws, that is awesome! There's plenty of space for your fingers to pull on the knob, I don't have small hands. It was great decision to buy these. Rated 5 out of 5 by Rich from Simple but classic knob Wanted knob that would highlight the black detail bead on the cabinets and this fit the bill perfectly. Mate finish very good and look tike they will wear well.